Man, I feel like a retard (no offense to people with feelings or who may or may not be retarded or know someone who may or may not be). As soon as you send me your addresses, I know the database will light up like a Christmas tree, er, a Jack-O-Lantern. Please just send me your addy to davidinark@yahoo.com. Thanks! I also owe a couple folks some random packs, and those will go out this week too. My deepest apologies for not getting those this past Monday as I had said! I'm letting go... (sidenote - "Letting Go" is one of my all-time favorite Joe Cocker singles). If you are reading this, and you are an Indians and/or Expos/Senators/Nationals fan, then you have been given the green light to take over my spot in I-Am-Joe-Collector's monthly box breaks. The breaks have been fun and have netted me some very cool cards, but I am stepping out of the way for someone else to come in and take over. I left a comment on Joe's blog, making it official, so those of you that want to step in and grab some Tribe cards, rush on over and tell Joe you want my spot(s)! Now before anyone starts up the rumor mill, let me say that the reason I am bowing out is because the seasonal giveaways are coming up and I want to use my card funds for fun and games in sharing and spreading the wealth of card collecting! Sure, I could forego "12 Days" this year, but, um, well, no I can't. I enjoy it way too much! Do you know Jack? How about John? Most of you know him as JackPlumstead on The Pursuit of 80's(ness), and I usually refer to him as "John from across the pond." No matter how you look at it, when a package of cards comes from Westgate-on-Sea, I know there will be cool stuff and that I am trading cards with a guy in England (and NOT England, Arkansas either)!! I realize this is a bit of a digression here, but take a moment to stop and think about that - trading baseball cards with people all over the world. When I was a kid, I had a group of friends (my brother, Mike, David (not myself, of course, another one), Anthony, a few others) that loved to trade cards. We were young and naive then, so we liked to glue the cards into sprial notebooks. Then, when it was time to trade, we would rip the cards off the pages and trade them. We never cared what the BACKS looked like, it was all about the fronts and who was on them. We even made insane trades for checklists if the right person's name was on the thing. Fast forward to today. My circle of trading friends has grown immensely, and now it is more than the folks I see on a regular basis (or on any basis). Thanks to Internet in general and "the web" & blogging specifically, I am trading cards with people from all over the US (one of which lives about 35 miles South or so) to other countries! Perhaps I am being a bit dramatic to some of you, but I am young enough to se the world as flat as it has become, but I am also old enough to appreciate exactly what that means. "My grandpa was in World War II, He fought against the Japanese. He wrote a hundred letters to my grandma; Mailed em from his base in the Philippines. I wish they could see this now, Where they say this change can go. Cause I was on a video chat this morning, With a company in Tokyo." Web pages, online checklists, blogging, audio podcasts, online video box breaks, trading cards with far away lands. We live in some pretty amazing times. And speaking of amazing things, THANK YOU, JackPlumstead, for some VERY cool cards! 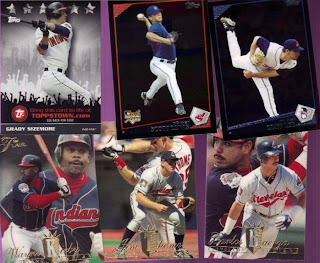 I am a huge fan of the thick Fleer eX and Flair cards! I also like the Topps Attax cards. I know a lot of folks don't but, I am a big kid at heart, so anything that is 'gamish' appeals to me! The Sizemore StarQuest foil card is a great example of how companies should use foil on cards - just enough for a WOW! factor, but not so much you can't read the bloomin' thing! I like the blackout 2009 Topps cards, too. They're different. I also appreciate the Joel Skinner card. I think he got the royal shaft when he was cut from the team during the de-Wedging of the Tribe. Skinner was not the greatest Triber to play for the team, but I believe he is one of biggest FANS of the team. I don't know how many players feel about such things, but if I had played for a team and then was working on the team in ANY capacity after my career was over, I'd call that pretty fulfilling. I loved getting these! Again, thanks a bunch!! I am presently "borrowing" internt access from my mother-in-law, who lives across the yard from us. We got a TON of rain over the past few days, and evidently our DSL runs in the open and dies when added to water. I have card packages from John across the pond and my cards from the I Am Joe Collector Goodwin Champions break. I think I might have another package, too, but I'm not looking at them to know for sure. I will be posting the pics and packages once things are back to semi-normalcy (things are never normal for me, just ask my wife). Good luck to me, right? I was out of town for the past several days, though I had created a few scheduled posts so things wouldn't lie dormant for too long. I have to admit, I like scheduled posting. This is not one of those. So, did you see it? I was "Alomared" in BaseballDad's own special way. Every other card was a Steelers card! How cool is that!? Oh, what? You mean that WASN'T the "coincidental trick??" Are you telling me that the trick WASN'T a stack full of Steelers card to an Indians/Steelers fan? What do you mean? Are you saying that not only did he send every other card as a Kenny Lofton, but it was the SAME Kenny Lofton card? I just want to know if dayf put him up to that!? As an aside, there are some very cool Steelers cards in there! This was something of a trick AND treat! THANK YOU very much, Baseball Dad!! This was a lot of fun! My wife laughed when I started showing her the pile of cards. Well done. I received a package from Max in the mail the other day (well, a few days, really). I had to do a double-take because he just recently sent me some cards. Sure enough, they were from him with a note stating, "these should have been in your last package..."
HOLY SMOKES! These are very cool inserts and parallels of some GREAT Tribe players: Lofton, Belle, Carter, and a whole slew of Murray. And then, just for fun, Max tossed in a 1957 Topps Gene Woodling! Man, this was another great surprise from Max! 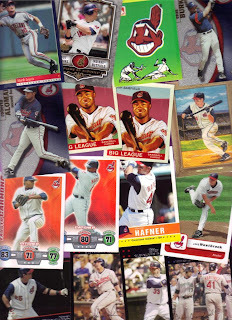 Thanks a bunch for some VERY noteworthy Indians! It's a manufactured patch, but it at least LOOKS like it could have been cut from an Indians uniform. Also for no good reason I could think of at the time, I signed up for the "Expos, Senators, Nationals" team in addition to the Indians for his group breaks. Looking back, it is one of the best decisions I've made in a while, I think. I have yet to come up empty-handed and some of the cards I end up with are not bad at all. 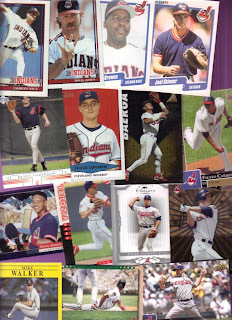 Of course, the real reason I jumped in on the group breaks was for the Indians cards! I ended up with some doubles, so those will be, er MIGHT BE, tossed in to someone's trick-or-treat bag this year! I am thoroughly enjoying the group breaks! Way to go Joe! Oh, yes, it is time. It is that time of year in which you knock on my door and say those magic words ("trick or treat!"). And what do you get in return? You get either a trick or a treat sent your way, just in time for Halloween! All you have to do, if you dare, is respond to this post with the magic words. If I don't know where your house is, I won't be able to send your tricks or treats, so please make sure I have your address! I would venture a guess and say that I have most of the address of my victims, er, readers. But, to be on the (un)safe side, you might want to drop me a noose, er a line, at davidinark@yahoo.com or davidinark@gmail.com and I will add you to the list of victims, er, recipients. Trick or Treat gifts will be mailed near the end of the month, as all hallow's eve approaches...... Make your request at your own risk! Yeah, "The Willie Blair Project" was going to be one of my entries for this year. I read his instructions. I got a little sidetracked. I was watching "For Love of the Game" and saw "EW Top 25 1999" in Thorzul's post. What I missed was the "Pre-1985" part until I re-read the post. So, I present the incomplete work above. Perhaps tomorrow I will take up the task once again, only this time I'll pay more attention.